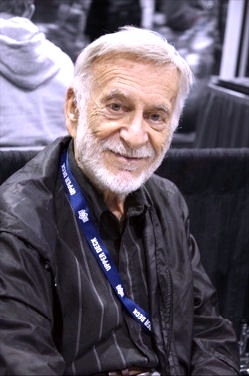 Jerry Robinson at ComiCon in 2008. The other day I noted that Batman’s sidekick, Robin, was named after comics creator Jerry Robinson, the late artist who consulted on the “ZAP! POW! BAM! The Superhero: The Golden Age of Comic Books, 1938-1950” exhibit open now in Maryland. Robinson was still alive when the exhibit showed locally at the Skirball a few years ago. He was interviewed for the Los Angeles Times’ Hero Complex blog in 2009. Five or six years ago, at ComiCon I am wheeling Ray around the main hall. Coming the other way is Jerry Robinson, also being wheeled around. They both saw each other at the same time, and reached out to hug each other (really just grabbing each other’s arms). The look on the faces of the attendees was priceless. They’d look left, and utter OMG it is Ray Bradbury, then look right and utter OMG it is Jerry Robinson. Ray and Jerry was oblivious to the surrounding as they were just happy to have run into each other. This entry was posted in Graphic Examples and tagged Batman, Jerry Robinson, Ray Bradbury by Mike Glyer. Bookmark the permalink.